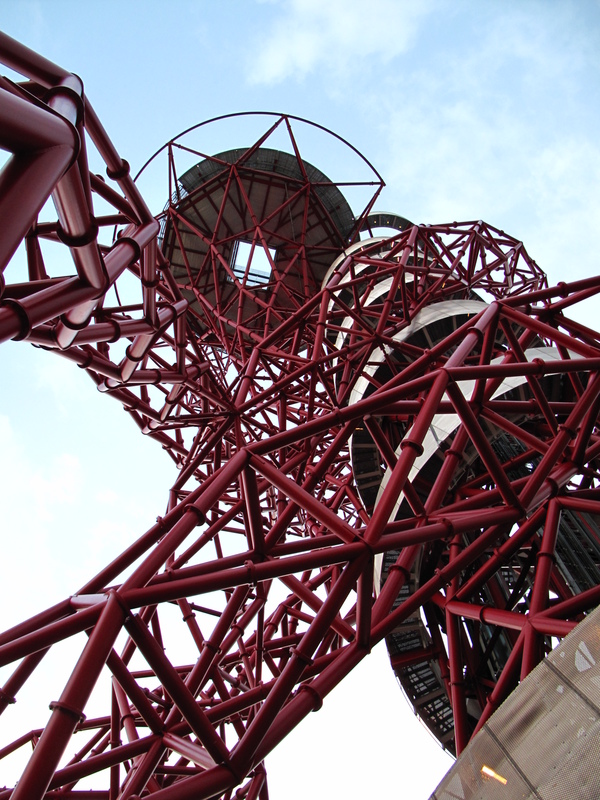 Following on from last week’s post about my visit to The Orbit, I thought it’d be nice to post a couple of other views of the Olympic Park that I’ve taken recently. First up is an aerial shot of the park that I took on a recent flight back into London. We flew in early on a sunday morning, and were lucky enough to have a fantastically clear view of the city, including flying right over the Olympic Park. 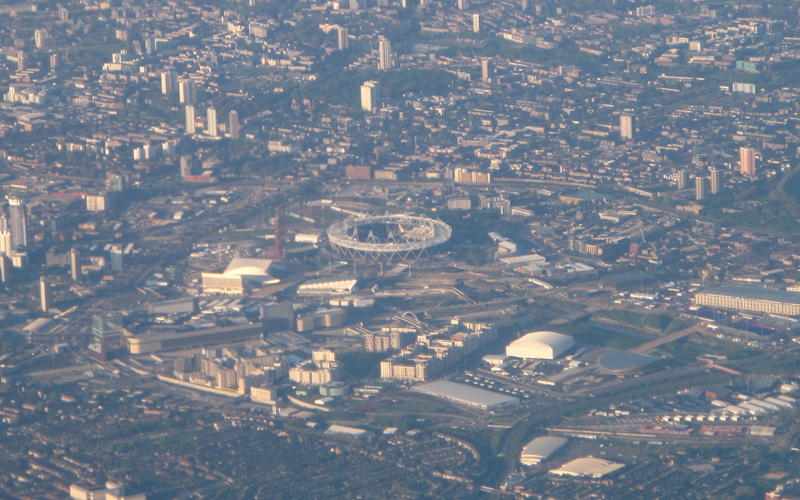 The Olympic Stadium itself is in the centre of the photo, and immediately to its left are the Orbit, Aquatic Centre and Water Polo Arena. Towards the bottom left of the photo is the Olympic Village. 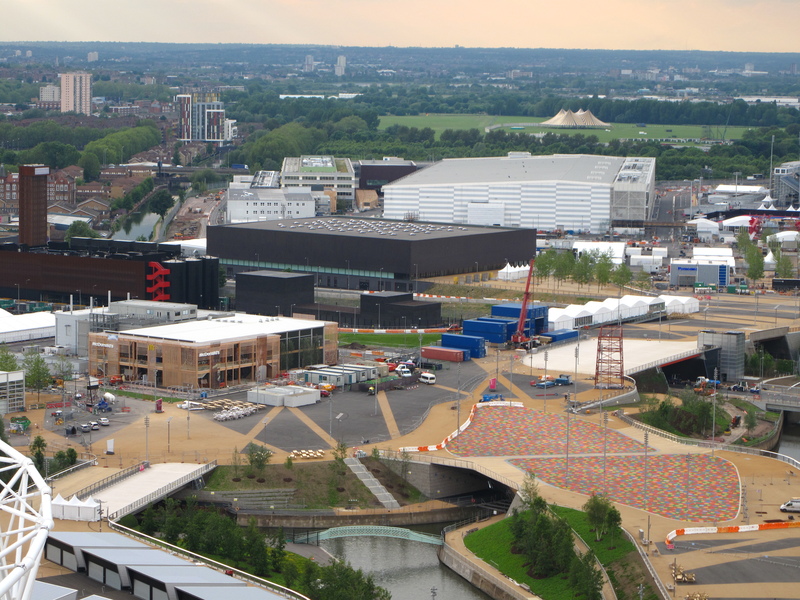 To the right of the village is a large, white box which is the Basketball Arena; to the right of that is the curved roof of the Velodrome, probably the most attractive of all the Olympic venues. To the far right of the picture you can just about see the Hockey pitches, right in front of the huge International Broadcast Centre. 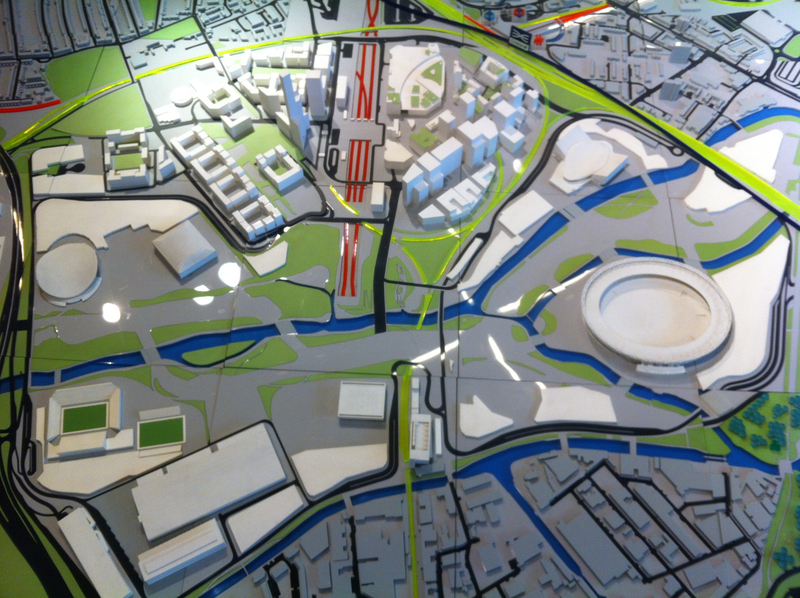 You can get a clearer picture of the park’s layout from my second photo, which is a model of the Olympic Park, part of New London Architecture’s huge model of Central London (which is well worth a visit if you’ve never been). This photo is oriented with the southern end of the park (the Olympic Stadium) to the right, and the northern end (with the Velodrome) to the left. You can see the rest of my Olympic photos here. 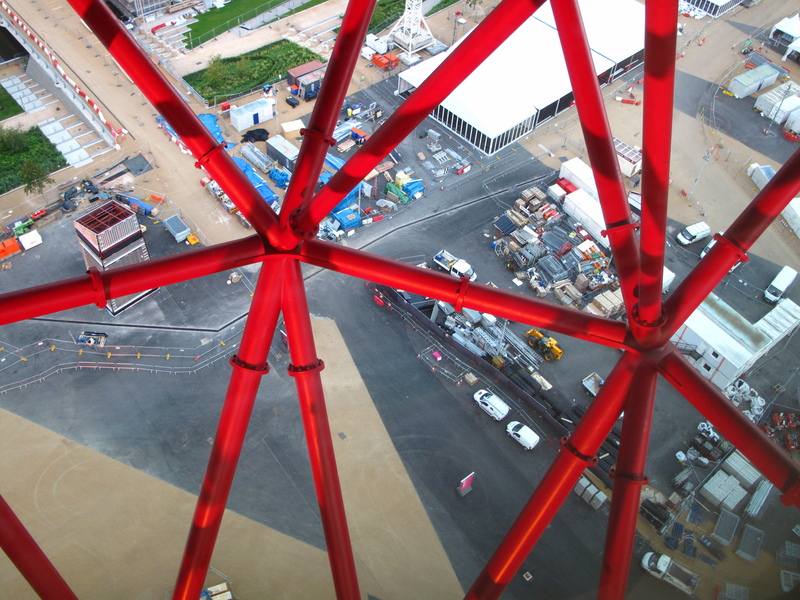 Earlier today I was incredibly lucky to be one of the first people to go up the Orbit. Even before the Olympics has started, it’s already become one of the most recognisable structures in the Olympic Park, and is no doubt soon to become familiar to people around the world, as it’s bound to feature prominently in TV broadcasts from the park once the games begin (especially as there aren’t that many spectacular buildings in the park). Getting in was no different to the procedure that would be familiar to anyone who’s been to a test event in the park recently – arrive from Stratford, and cross the road to go through the efficient and friendly airport-style security. Once through it was a short walk in between the Aquatic Centre & Water Polo Arena, over the river via footbridge, and there it was. 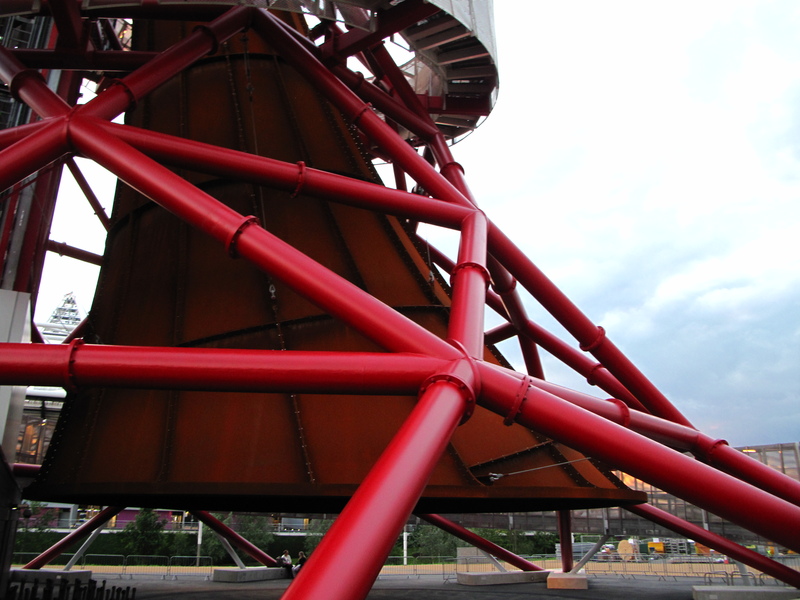 The biggest surprise on arrival is that there’s a strange rusty iron bell hanging out of the bottom (the Guardian’s art critic described it as an arse – I can’t see it myself). Just behind that is a little structure that contains the lift the whisks you quickly up to the top. 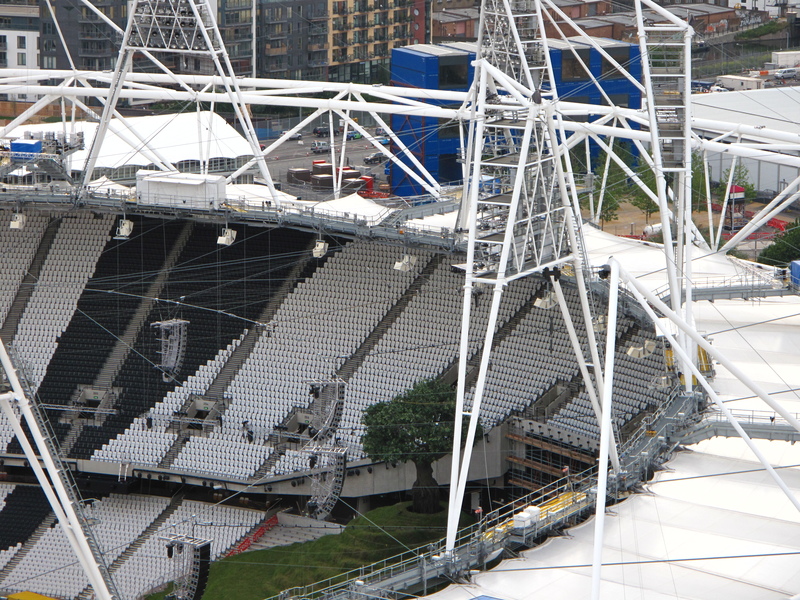 On reaching the top I was delighted to see that you can actually get outside into the open air, with two little balconies on either side, one of which has great views right into the Olympic Stadium next door – good enough that we even got a little sneak preview of the opening ceremony, as we could see a little grassy hill with a tree on it at one end of the stadium (you can read more about that, and see where the tree will sit here). 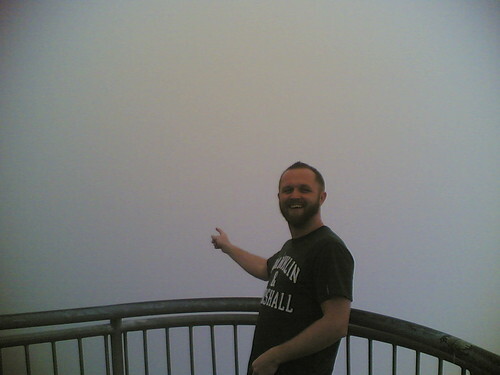 The viewing platform itself is lovely – wide and spacious, with fantastic views on all sides. We were lucky enough to have clear skies tonight (especially given how grim the weather has been recently), so we had clear views all the way out to Wembley and beyond. In fact, with the O2, Excel, and Wembley all in sight you can see almost all of the major games venues from up here. The platform also had one other surprise – inside are two other Anish Kapoor sculptures, huge curving mirrors not unlike the C-Curve mirror that was in London’s Kensington Gardens in 2010. The biggest surprise of the day was how it changed how I feel about the sculpture. Beforehand I really couldn’t make up mind about it. Now I’ve been up, I’m a total convert. To see it at close hand, from underneath, from above, from inside, and from the stairs on the way down, is to experience it totally differently from seeing it from far away. The shape curves and twists in different directions, giving a different view from every angle. It’s incredibly solid but incredibly lightweight at the same time, with the slender struts leaving plenty of room for views in between. Most people I’ve spoken to up til now have been pretty ambivalent about the Orbit, if not downright hostile. Based on tonight, I reckon that’ll change pretty rapidly. 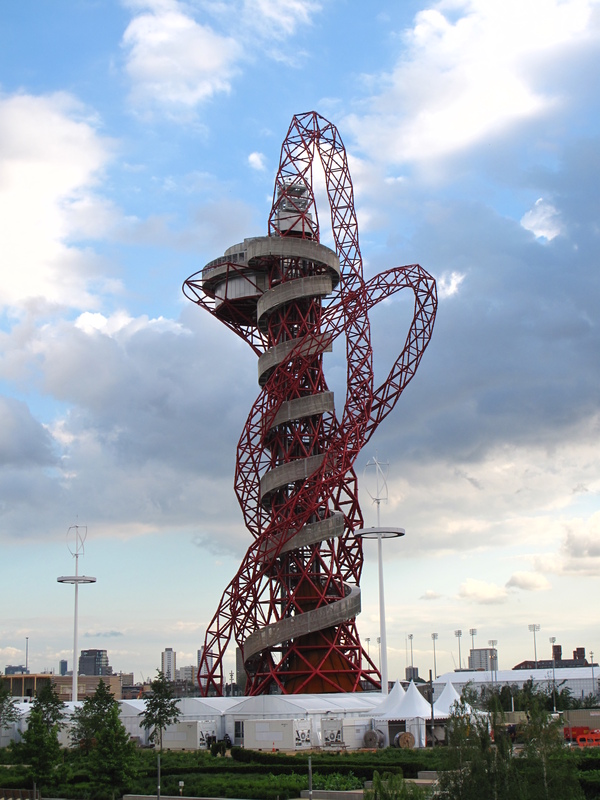 It may look like a big red squiggle, but close up the structure itself is fantastic, and the views even better, and I think Londoners are soon going to grow to love it. You can see my full set of pictures of my Orbit visit here. I have to admit, I am becoming slightly obsessed with the Olympics. Last week marked 500 days before they start, a date marked by the erecting of giant Olympic rings at St. Pancras station, the tickets going on sale, and a slightly crap-looking countdown clock appearing in Trafalgar Square (which, in typically British fashion froze on the same day). I’m starting to worry that if my current levels of excitement carry on for the next four hundred and ninety-odd days I’ll be exhausted by the time they actually kick off. It’s been building slowly for quite a while. My earliest Olympic memories, from 1984, when I was 9, are all Athletics-related, thanks to my Dad being a big fan of the sport, and the big British successes (Daley Thompson’s memorable Decathlon win, and the epic battles between Steve Cram & Seb Coe in the 1500m, and Tessa Sanderson vs Fatima Whitbread in the Javelin). I carried on mostly watching the Athletics over the next few years, and it wasn’t until Sydney in 2000 I started to watch a much bigger range of sports. By the time the vote took place in 2007 to decide whether or not London would get to be host the obsession had well and truly kicked in – on the day the announcement was made I spent a big chunk of the afternoon at work sharing a pair of headphones with the only other colleague who was interested listening to radio trying to find out if we’d won, and when the vote finally came through we both screamed, getting us some filthy (and rather confused) looks from the rest of the office. By the time Beijing came round in 2008, I watched as much as I could – my interest obviously being helped by the best modern performance of the British team, including in more obscure sports (who knew I could I could get so excited by Taekwondo or Modern Pentathlon?). I even managed to get enthusiastic about sports with no British interest, like Handball (more fast-paced and exciting than Football) and Water Polo (admittedly helped here by the fact this one wins my vote for the fittest men). In fact by the end of it I’d watched at least a little bit of every sport except the Volleyball (and only because the BBC never seemed to show any of it). After a break in following the build up while I was away travelling, I’ve been following the news closely ever since I got back, devouring every update I can find, from the high-profile stuff like what they’re going to do with the Olympic stadium afterwards (as an Athletics fan I am VERY glad they’ll be keeping the athletics track) to the bits of little interest to anyone but Olympic-geeks like me (the anxious wait for host-nation places for the Brits in sports which we’re still working out how to play, like Handball). I’ve now made three pilgrimages out to Pudding Mill Lane to watch the progress in the Olympic Park (there’s a fantastic close-up of the main stadium and aquatics centre from the nearby elevated Greenway, best viewed from the temporary cafe there which also, helpfully, does the finest bacon sandwich I’ve found in London), and will be back again over the coming months to watch, intrigued to see if the main stadium will continue to look so dull, continuing to be angry that the temporary seating around the aquatics centre have ruined the view of Zaha Hadid’s gorgeous curving roof, and desperately hoping that the massive 115 metre high Anish Kapoor sculpture/viewing platform next to the stadium turns out to be as beautiful as his previous beautiful installations for the Tate Modern and Kensington Gardens and not as ugly as the drawings suggest. The main focus for my excitement right now is applying for tickets. Obviously I want to go and see as much as is possible, but it’s turning out to be both confusing and frustrating. Applying for Glastonbury tickets is like child’s play in comparison. That just takes lots of mindless but frantic clicking and refreshing. This is more like playing 4-dimensional chess. While blindfold. And not being able to see what the other player is doing. Being interested in too many sports is the first problem, as there are far many things going on each day. Take Sunday 5th August for example. Do I want to try to watch the Men’s Pommel Horse final in the Gymnastics? Or the Cycling Sprint finals? Or the chance to see Ben Ainslie win his 4th consecutive gold medal in the sailing down in Weymouth? Obviously I want to see all of them, but they’re on simultaneously. Each time I think I’ve worked out a combination of events to apply for, I find I’ve left no room to apply for a sport I want to see. Or that I’ve chosen two consecutive sessions that are on opposite sides of London, which will be impossible to get between thanks to crowded public transport and slow security. Then there’s the issue of how many to go for and at what price. The complexities of this issue are discussed in a lot more detail by my favourite London blogger, Diamond Geezer, here – and it’s well worth a read if you’re thinking of applying, as it covers all the potential pitfalls as well as the detail of the process. But basically any over-subscribed event becomes a lottery, and any under-subscribed event you’ll be guaranteed tickets. When you apply for tickets, you are committed to paying for ALL of the events you applied for, if your name comes up for each one. This is a potential nightmare – if I apply for too much (assuming I won’t get loads because they will be too popular) and get them all it could cost me thousands. If I apply for too few (to be more financially cautious) and get none I’ll be furious. Then there’s the price issue – obviously applying for higher price tickets will give me a better chance of success, and a better view, but equally they risk breaking the bank (the best Athletics tickets are £450 for most events, for example). Despite building a rather impressive spreadsheet (yes, I am really that much of a geek) the permutations have been doing my head in. I’m finally getting close. I think I’ve decided to apply for some higher priced tickets for my favourite sports (Gymnastics, BMX & Athletics), mixed up with cheaper tickets for qualifying rounds for a wide range of more obscure sports. The Athletics has been the hardest of all to choose – it annoys me as someone who’s been a fan of the sport all my life that these will be some of the hardest to get because of its status as the premier Olympic sport (to all those people applying for tickets for this: I ask you where were you when I was getting drenched in the rain at Crystal Palace on the wettest night of last summer watching the British Grand Prix???). But I’m praying that everyone else applies to see the 100 metres or the bits with major British interest like the Heptathlon or Triple Jump, leaving me to get good seats to see my favourite athlete, the American Allyson Felix, try to finally beat her long time rival, the Jamaican Veronica Campbell-Brown to gold in the Women’s 200 metres. They’re both incredible athletes, and Felix has three consecutive world championship golds – but has lost out to Campbell-Brown in both Beijing & Sydney. Should be an incredible race if they’re both there, and I desperately hoping to be there to see it. I still haven’t worked out what to apply for yet (thank god the organising committee has given me 6 weeks to work it all out) and my current work-in-progress wish list would come to well over £1000 if I got everything I apply for – although increasingly I’m starting to think I’m quite prepared to pay that for this once in a lifetime opportunity to see the Olympics in my home city. It’s been a pretty grim start to the autumn in London so far, which has been particularly depressing for me – I carefully planned my trip to avoid cold weather everywhere in the world so the impending winter will be my first for nearly two years – and then suddenly, unexpectedly, yesterday turned out to be glorious. Now you may call me biased, but in my opinion there is no more beautiful city in the world than London on a day like yesterday. The blue of the autumn sky is deeper and the sun more gentle which flatters the city’s buildings far more than the harsher summer light or the usual grey skies. And not only were the skies clear, but it was unseasonably warm too – over 20 degrees. Knowing it might be the last warm day of the year I rushed out to enjoy the sunshine and went for a lovely long walk through the city, starting out at London Bridge, wandering along the Thames, stopping off here and there along the way for coffee and to read the papers, but mostly playing with my new toy – my iPhone (when I left the UK no-one I knew had one and I vowed I'd never get one; by the time I returned everyone I knew did so I eventually succumbed) and the marvellous Hipstamatic app that produces lovely retro-styled pics. Every step of the way and London was looking ravishingly gorgeous, especially all along the South Bank. As I crossed the Thames towards Charing Cross the sun was starting to dip in the sky and I suddenly had the urge to catch the sun set, so headed up through Soho, along Piccadilly and into Hyde Park. Suddenly it was like being back the height of summer – the place was packed with people eating ice cream, boating on the lake, showing off on rollerblades, and even sunbathing with their shirts off. The highlight of the day was still to come though, for as I crossed into Kensington Gardens I remembered that the new Anish Kapoor installation had just opened. It consists of four monumental, stainless steel sculptures that reflect their surroundings, changing in appearance with the time of day and the weather. They were all stunning. 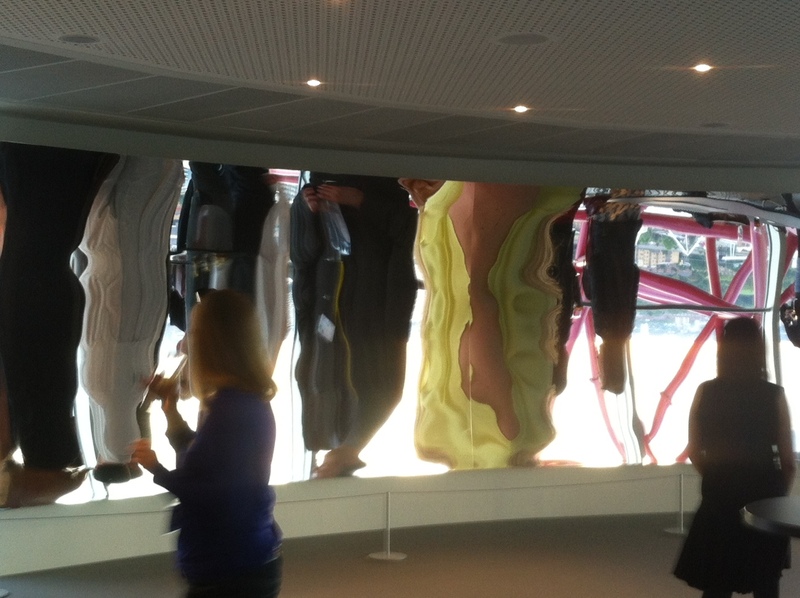 I think my favourite may be Sky Mirror, a giant concave circle that sits facing out across the Serpentine. But each is quite different and I’m going to have to go back soon to see them at different times of the day (especially Sky Mirror, Red – with the sun setting behind, it just looked black rather than its normal red). I’d made it just in time to see all four before the sun shone its last rays across the Round Pond and finally dipped behind Kensington Palace. It was the perfect London day, and after a week where I’d been missing travelling reminded me how lucky I am to be living here. It’s taken me more than three months of being back to get round to writing this. I’m not quite sure why. It’s partly because I’ve been quite busy catching up with friends and trying to find a job, but I think it’s more the fact that writing about home seems quite dull after all the exciting things I was up to while away. Lovely as it was to be met by my parents at the airport, suddenly coming face to face with English weather after a year away really made my heart sink. I’d planned carefully to avoid bad weather for most of the year, and so to arrive back in London at half six in the morning to be faced with freezing temperatures, grey skies and pouring rain was a real shock to the system that made me desperate to be back on the beach in Cambodia. The misery soon subsided though, as pretty soon I barely had time to notice the weather as I threw myself into the task of catching up with friends and family. One of the joys of being away was meeting so many wonderful people everywhere, making new friends almost every day – but being back home I suddenly really realised quite how much I’d missed everybody, and how emails, the odd phone call, and facebook status updates really are no match for catching up face to face. I soon realised that my travels were clearly not half as interesting to other people as they were to me – perhaps people had seen all they needed to see from photos, or reading the blog, or perhaps hearing about other people’s travels just isn’t that interesting (although it is to me) – either way, in most instances I found the subject was changed pretty quickly after first meeting up with people, often after just one question (which incidentally was normally ‘what was your favourite country?’ – I’ll answer that one in a later post). It also felt strange chatting to many of my friends who said the year had flown past and that little had changed in their lives – whereas I’ve done and seen so much. The thought that my next year might end up being repetitive and samey was one of the first things to worry me. The other thing I soon realised I’d missed was London. I’ve been to some amazing cities in the last year, but I have to say none of them quite match up to my home town. London is rightly famous for its museums and galleries, and I’d really missed the incredible nightlife, but I’d forgotten quite how beautiful it is in places, how green it is with all its parks. I arrived home after a year of being a tourist, and I’ve made a real effort since getting home to keep it up. So I’ve tried to make the most of my free time to explore the city as much as possible, checking out parts of the city I’d never been to before (like the wonderful parkland walk along a disused railway line and through ancient woodland from Finsbury Park to Alexandra Palace, and the Greenway with it fantastic view over the new Olympic stadium). Three months in and I’m still not bored of it. It’s not all been great though. Applying for jobs is a slow and boring process. My head knows I need to return to work but my heart would still rather be out there still, on the road. I feel like I’ve forgotten so much while being away – and that was confirmed in my first job interview where the feedback was that I ‘lacked gravitas’. Whoops. I quickly realised it was time to grow up and realise that this was something I had to take seriously. After a while boredom began to settle in – with all my friends working 9-5 jobs, I had five days a week to fill. I spent plenty of time out sightseeing, but doing it all alone started to get boring, and I soon began to feel less motivated. I found myself getting out of bed later and later, and eventually I found the lack of structure beginning to get me down a bit. That was fine when I was moving on every few days, but after three months in one place it got much harder. The frustrations of being on my own all day and not having a job were balanced out in other ways though – for it’s taken being back for me to realise quite how much I feel I’ve changed a person since being away. The biggest change is how much more confident I am as a person. I never used to be comfortable meeting new people, or in large social situations – but being away has changed that, I think simply by the fact travelling alone has forced me into being in that sort of situation every day, and realising there’s nothing to be scared of. Aside from that, I do feel like I’m no more adventurous than ever, I’m more relaxed too. Best of all though I genuinely feel happier than I ever have done. Even if I hadn’t had quite so many amazing experiences while away, the trip would have been worth it for that alone. This phase of my life is now drawing to a close. After a year of travelling, and three months of settling back in, and job-hunting, I’ve now found one, and I start work on Monday. Half of me is delighted – I’ll have some structure back to my life, and crucially I’ll have a salary again (very handy for paying for future holidays). The other half of me is frankly terrified. I’m worried I’ve forgotten everything I know. I’m worried that I’m so used to doing nothing that the discipline of working will be beyond me. The idea of getting up every morning and having to deal with commuting scares me. Fingers crossed it all works out. So what next for the blog? Well in the short term I have a few round-up and ‘best of’ posts to come, just for completeness sake. Plus I have a report on my recent trip to Croatia (which I treated myself too after getting the job). After that – well I plan to continue to write about life in London, as well as all my future travels – of which hopefully there will be lots! Walking is something we used to do a lot as a family when I was a kid, and while I never did much after leaving home and throwing myself into London life, I think my childhood experiences were always at the back of my mind. As I’ve grown older, the urge to get out of the city and explore the mountains has grown and grown, and finally last year I made more of an effort to do so, with trips to Snowdonia, the Yorkshire Dales and the Lake District all helping to really awaken a long-dormant passion. As a result, the part of my trip I’m probably looking forward to most is spending August & September trekking in the high central Andes of Peru & Bolivia. Now while I’ve enjoyed my time hiking the UK’s hills, and had no problems with them whatsoever, there’s quite a difference between the 1,085 metres of Snowdon, the highest peak I’ve visited over here, and the Punto Coyoc pass on the Huayhuash Circuit in Peru, which at 5,490m is more than five times as high. So I figured I should probably make a bit of an effort to get as fit as I possibly could before leaving if I want to make life a little bit easier for myself. So since November I’ve made the effort to get into the routine of exercising three times a week, at my local boot camp. 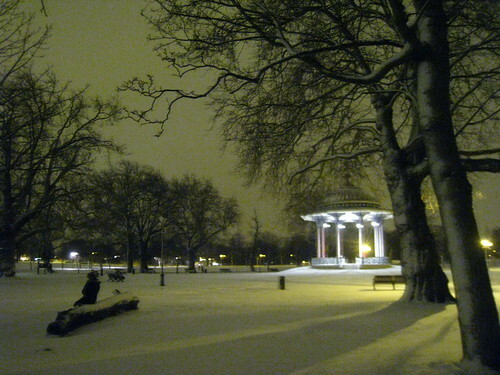 Now to most people I know, the idea of spending cold winter nights outside in the park, running around and doing press-ups in the mud and the rain (and even the snow on one occasion) while being barked at by ex-squaddies sounds both insane and painful. They’re probably right, and yet it’s actually great fun, and is the most sociable way of making fit I’ve ever engaged in. Plus (and this is the real reason I enjoy it) it really appeals to my competitive streak, as I push myself harder and harder to be the fastest in the class, and progress to the advanced group. The upshot of all this hard work is that I’ve been feeling fitter than I have in years – and both to test that out and to give me an interim goal to work towards, I entered myself into a 10k run this past weekend, my first for a few years. Now I knew the training had been going well, and I expected to beat my previous best time of just shy of 50 minutes. What I didn’t expect was to beat that by more than five minutes, with a time of 44:57. I even enjoyed it (what’s happening to me in my old age? 18 year old me would have been horrified…), and now I’m seriously considering trying out a marathon when I get back from my trip. I’m feeling a lot more confident about the summer’s coming activities (although of course, now I’ve done the run, I’ll slip into a final month of farewell drinking, followed by doing very little exercise during the first few months of the trip, and undoing all the good work). My friends Rob & Briony are currently on their honeymoon in Brazil, where they’ll get the chance to experience carnival in Rio. You might think I’d be jealous – in fact, I’m not at all, as today is PANCAKE DAY. 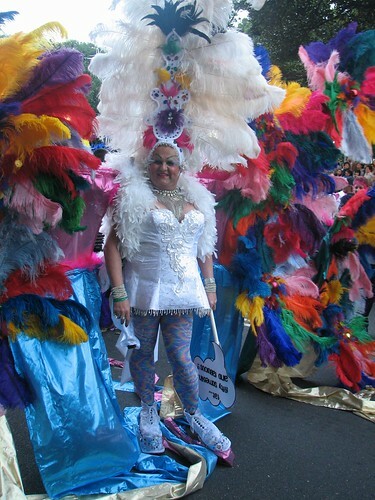 Now I understand how people may be more easily impressed by carnival spectacles such as the samba bands in Rio, the drunken debuachery in Cologne or the drag queens and dykes on bikes at Sydney Mardi Gras. By comparison, the practice of partying before lent begins by eating pancakes may seem a little bit tame. But really. You can get drunk, throw on a frock and cake yourself in makeup any day of the year. 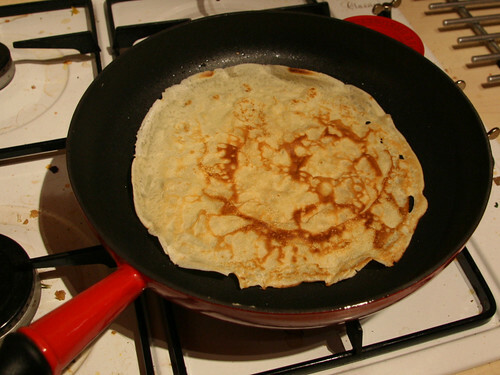 Whereas it is a true FACT that pancakes only taste this nice for one day of the year, and that is today, pancake day. Most of the year I can take them or leave them. But today, I plan to stuff myself. I’ve already managed to get off to a good start, as I happened to pass a cafe in Wandsworth this morning serving them (I wasn’t going to let the the little fact that I was on the way to the dentist stop me). I may try and find more for lunch. And then will be making them at home this evening. Sugar. Lemon. Currants. Pancakey goodness. Mmmm. And lots of it. Actually, I’m not normally quite this obsessed with pancake day. But as the start of my trip gets ever closer I’ve suddenly found myself getting obsessed with various comfort foods from various periods of my youth. Saturday evening saw me eat my first Viennetta in years. Last night was tinned rice pudding. I’m already plotting various must-eats over my remaining nights, and thinking long and hard about which of my mum’s favourite meals I’ll be begging for on my last trip home. It’s silly really, I’m only going for a year, and it’s been far longer than that since I ate half of these things. Clearly my sub-conscious has started missing home before I’ve even gone. Anyway, whatever the psychological reason behind it: I just can’t get enough of pancake day. Actually, writing about it now gets me thinking – is this just a British thing, or did we manage to export the tradition elsewhere? In my attempt to list out all my favourite travel places before I leave for my RTW trip, I’ve already covered off countries, cities, world heritage sites and islands, to give me a base to compare against when I get back. Given my growing love of the great outdoors, I figured it was time to tackle my favourite national parks. 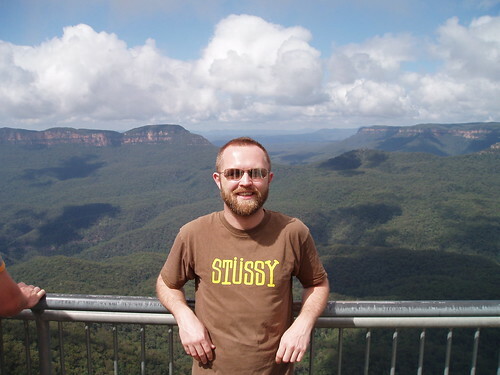 Not just my favourite World Heritage Site, but my favourite National Park too. 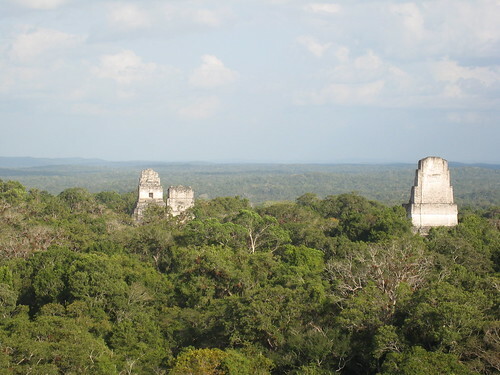 Not many national parks have huge ruined Mayan cities in the middle. Even fewer have howler monkeys too. If you haven’t heard a howler monkey in the wild, you haven’t lived (you can get an idea of the sound from myvideo). Everywhere you go you hear them make their strange strangulated roaring noises. While they howlers steal the show, the place is crawling with wildlife – in the brief time I was there I also saw spider monkeys, leaf-cutter ants, coatimundis and oscellated turkeys. Sadly I didn’t get to see a jaguar though. Probably the most famous in England, and deservingly so. 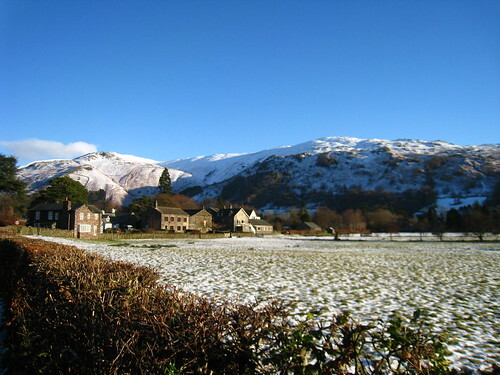 Seeing the hills covered in snow last December was truly the most beautiful I’ve ever seen England look. One of the wettest places in the UK (which is saying something), as I discovered on my visit. 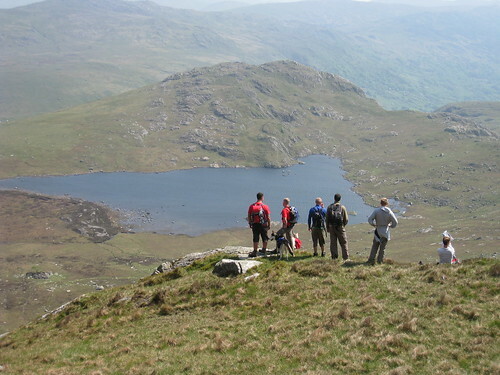 The mountains are of a very different character to the Lake District, with a less jagged and more open landscape. Plus with all the signs and placenames being in Welsh as well as English, it somehow feels more exotic than travelling within England. 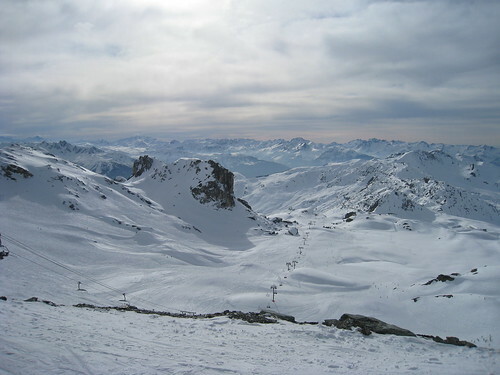 This may sound stupid, but one thing I’d never really considered over the years that I refused to give skiing a try, was that part of the appeal was the beauty of the mountains. The first morning I took the gondola to the top of La Grande Rochette, the view out over the Vanoise, France’s oldest national park, was simply breathtaking. For the rest of the week I kept having to stop (actually it was more that I kept falling over), and take it all in. Trains are by far my favourite way to travel. Mountains are my favourite landscape. 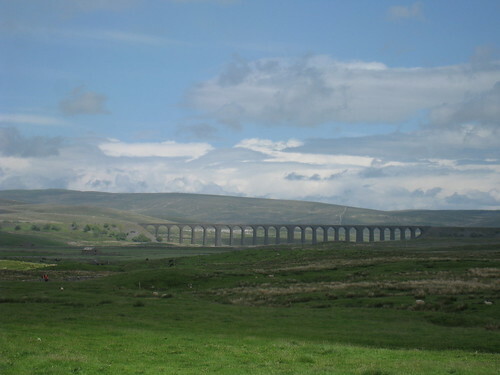 The Settle-Carlisle railway combines the two as it cuts its way across the Yorkshire Dales, and it’s quite spectacular (which just makes me all the keener to try Switzerland’s Glacier Express. Walking the Yorkshire 3 Peaks is one of the UK’s great walks (and one of my highlights of 2008); less well-known is that the park also has some of the country’s best caving. It may have great surf, but the Gold Coast of Australia isn’t really my kind of place. One of the things it really has going for it is the easy access to Lamington, part of theGondwana Rainforests world heritage site. It’s the largest sub-tropical rainforest in the world, and sits on a plateau that is the remains of a vast ancient volcano. 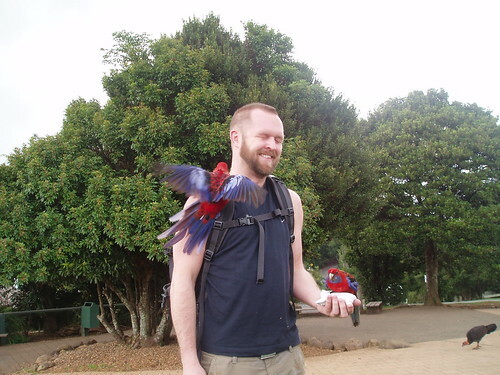 It’s great for hiking, and I had fun getting close to the local birdlife while I was there. The only National Park in the UK that exists because of its coastline, the Pembrokeshire Coast also has one of the country’s best long distance walks, all the way round the coastline. It’s also famous for its sea birds, particularly around the island of Skomer, which is a reserve. It’s also great for activities – coasteering during my brother’s stag weekend was one of the most fun days I’ve ever had. It’s the only ruined Mayan city on the coast. That coast is the Caribbean. 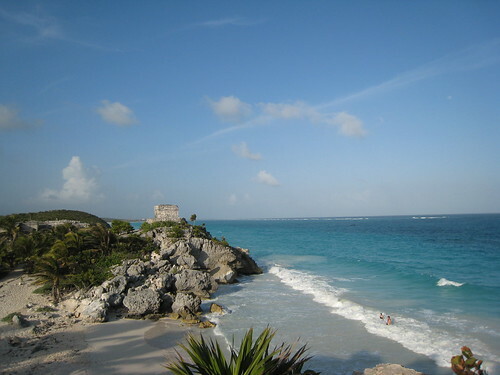 Ruined ancient city, on the cliffs overlooking white sand and turquoise sea. What’s not to love? If I had one gripe it’d be the crowds (all those daytrippers from Cancun). I’m sure if you asked most Brits to name all the national parks in the country, Northumberland would probably be right down the bottom of the list. Sitting right to the east of the Lake District, and at the lower, northern end of the Pennines that also contain the more dramatic Yorkshire Dales & Peak District, that’s probably no surprise. The plus side is that it gets far less crowded than those, and it’s just as beautiful. It also provides easy access to the stunning beaches and castles of the Northumberland coast, which in my book is by far England’s most underrated spot. So it continued to snow overnight, and by this morning we’ve now had the most snow for 18 years. It’s still snowing now, and it’s due to get heavier as the day goes on. As a result, London is now pretty much closed. All buses are suspended. Most tubes and trains too. The airports are shut. Most of the shops are shut as people can’t get in to work. Various commentators on TV are grumbling at how pathetic it is that the kind of snow most countries wouldn’t bat an eyelid at has paralysed our capital city. It’s even going to worsen the economic meltdown, apparently. Based on this morning’s walk on Clapham Common, I doubt you’d find many Londoners having any sympathy with that kind of moan: the atmosphere is fantastic. 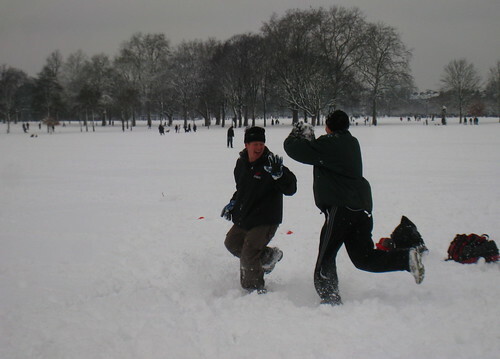 There are rarely this many people on the common even on a hot summer’s day, and everyone is wandering around smiling, saying hello to strangers, getting caught up in snowball fights and generally having fun. Who said London was an unfriendly place? It certainly seems to be bringing out the best in everyone. Enjoying it most of all are the children and the dogs (who knew there were so many dogs in Clapham? Also – I would say the dogs just about seem to have the edge over the kids in the enjoyment stakes, even the tiny ones whose heads barely poke over the level of the snow). 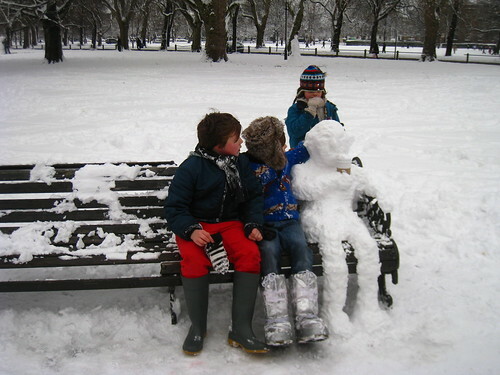 And there are snowmen EVERYWHERE. The way it’s going, tomorrow could well be the same. I haven’t taken an unscheduled day off work since 2005, so I think I’ve earned a day or two at home (especially considering I’m in my notice period). When the forecast said it was going to snow, I was a bit meh about the whole thing – snow is invariably rubbish in London, with the odd pathetic shower a couple of times a year, which then fails to settle (or even if it does, turns to brown slush within minutes). I certainly didn’t expect the heaviest snow we’ve had in years – at one point it was falling so heavily I couldn’t even see the block of flats just over a hundred metres away, and it quickly began to settle. Pretty soon the blizzard outside was matched by a flurry of excited tweets & Facebook status updates, and I figured I should make the most of the rare conditions (I think I’ve seen snow settle in Clapham maybe twice in the fourteen years I’ve been living here) to venture for a walk out on the Common. looked beautiful covered in snow, and being able to be the first to walk across the fresh blanket of powder had a similar effect on me, bringing out the urge to slide along the paths and down slopes. I even saw a couple of kids out with their dad, attempting to sledge down the slope at the side of the bandstand – I admire their efforts, but I’m not sure quite how exhilarating it when the slope in question is no more than three metres long. 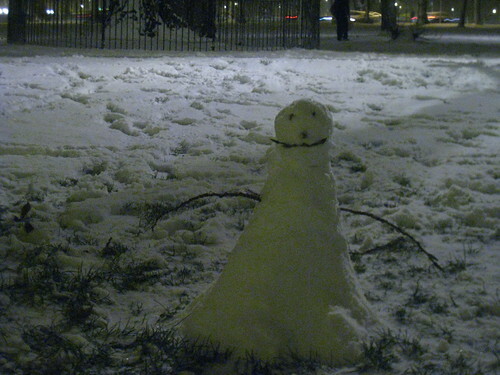 The snow also brings out a second, more serious group of people – the SLR photographers. All over the common, mostly hunched in front of trees, were men with tripods and big lenses, snapping away. In most cases, they were accompanied by bored-looking girlfriends, tightly wrapped up against the cold. I don’t envy them (although I’m looking forward to seeing the benefit on Flickr later, as their photos will no doubt be a hell of a lot more impressive than mine). Even on a normal day, when you’re stood in the middle of the Common, the noise of the traffic drops to a gentle background hum, and you can almost imagine you’re not in the city. In the middle of a blizzard, the effect is even more convincing. Stood there in the snow was about as peaceful as you’re ever going to get in London. Clearly most people had decided to stay inside in the warm, and I felt quite sorry for the legions of pizza deliverymen I saw gingerly making their way down the hill on their scooters. They didn’t look like they were having much fun at all. Back home in the warm now and there’s no end to the snow, apparently we’re due much more over night. Unfortunately, getting to work by tube means there’s no chance of skipping work due to being snowed in (and anyway, once everyone is out and about in the morning, it’ll be turning slushy pretty quickly), but nevertheless, it’s been nice to see London like this, especially as I’m about to embark on a year in the sun.